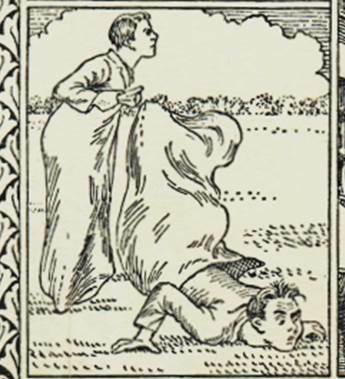 This, I suspect, is one of Eric’s best known images. It features as the March picture on the 2014 Ravilious calendar. All those who realise I love railways will think that I love this picture. Those who know I am a Wiltshire dweller will think I do, too, for the view from the train window shows the Westbury White Horse. That’s something I pass by on a fairly regular basis. In fact, here’s a 2001 view when the old horse was in need of a clean up. Yes, I do love the picture. It’s a great work of art but all is not quite as it seems. Eric’s original picture showed the Long Man of Wilmington through the train window. 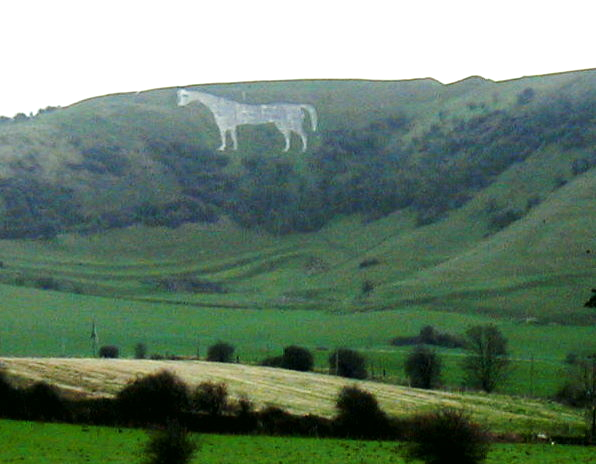 He wasn’t satisfied and his wife, Tirzah, a quality artist herself, did a real cut and paste job, affixing the Wiltshire white horse in place of the Sussex giant. As a railway nerd, I always thought that looked like an old Sussex train. 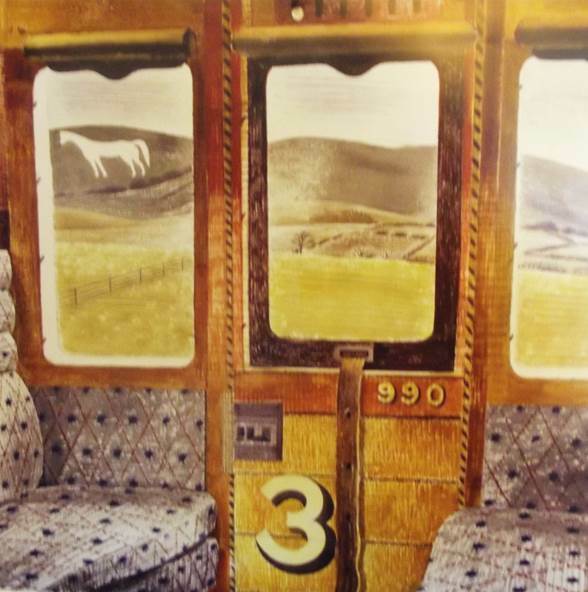 Everything about it says so to me, from the lettering showing a carriage number to the leather strap for opening the window. Somehow that carriage looked wrong in Wiltshire. Most folks won’t notice that. So all the brush strokes are by Eric, but the composition of the work is Tirzah’s. Between them – what team work – they created a wonderful and evocative image of times past. When we got married, back in 1971 some family friends from Germany were in England so naturally, they came to our wedding. A gift they gave us they called a row candle. Apparently, the idea was that if a married couple started to row, one of them would light the candle and blow it out when the row subsided. If the candle burnt right out then the marriage was over. So here, in 2014 after nearly 43 years of marriage is our row candle. It has never been lit. I think it fair to say we very seldom row but even if we did, I suspect the last thing on your mind would be to find candle, matches and start burning the candle. Of course we have differences of opinion. At the moment we are decorating and that’s a sure fire way of getting us into minor conflict. I love colour but it doesn’t stay in the memory and doesn’t impinge, particularly on flat surfaces. I like to see a variety of colours and I just can’t accept that there are rules of what goes together. People have opinions, of course but we are all allowed to have different opinions. When it comes to paint, carpets, wallpaper and soft furnishings, I really don’t mind. But I am forced to express an opinion. My wife has improved. My opinions always used to be greeted with, ‘oh no! That just wouldn’t do.’ It was often at that moment that I thought of the row candle but it was at home and we were elsewhere. These days my opinions are tolerated rather than rubbished but it seems impossible to get it across that I really don’t mind. Anyway, all decisions about present redecorations have been made. The row candle is safe. And I do rather like the reminder of our wedding, the 1970s and the German friends who gave it. Paul Piper was my mother in law’s cousin. He was a man I knew for as an adult he left his native Cornwall and came to live and work in Sussex, not so far from my home or that of my then girlfriend. That he, like his father, had kept a scrapbook, I had no idea until after he died and other members of his family ended up in forms of residential care. Then, out of the blue, his scrapbook came to us. I have picked one item from his scrapbook here, mostly because it brings a smile to me. Paul was awarded a certificate for coming third place in the four legged race at his school sports. …and what’s this? 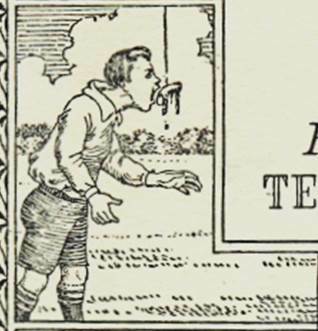 Bobbing for sausages? The certificate seems to carry a date of 1925. If that was the year in which Paul won it, he’d have been barely five at the time. 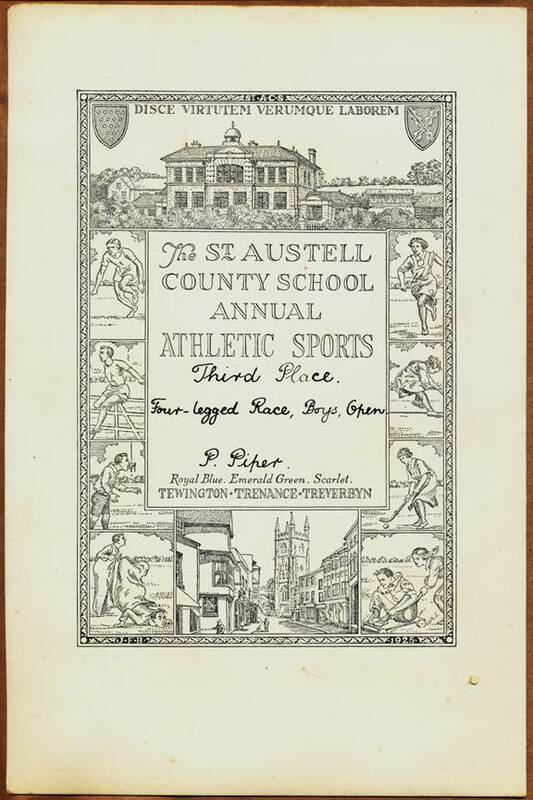 I think 1925 was the year the artist drew the certificate which shows the school itself at the top and a view in St Austell at the bottom. Paul would have been a pupil at the school in the 1930s. What a great certificate – such a fun family item. The school itself has evolved and changed but memories are kept alive on its web site. I like architectural curios. I think I mean by that I like features or whole buildings, with or without a real purpose, where efforts have been made to make things interesting for the observer. 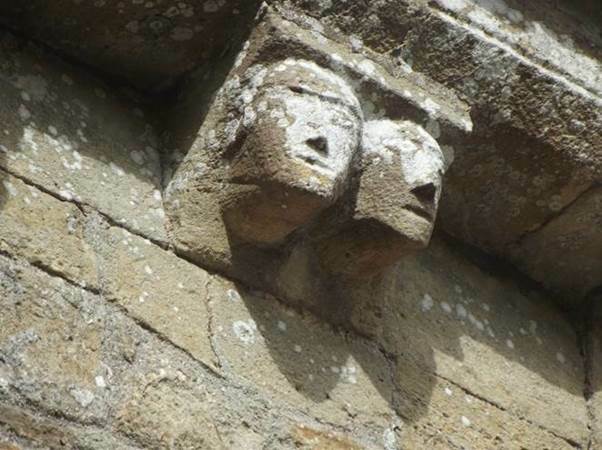 I recently came across the corbel table at Studland Church, down on the Dorset Coast near Swanage. Actually, we had gone to Swanage, but when there we realised there was a good bus service to Studland (and beyond) and as we are of the bus pass generation we decided we’d go to Studland, take a walk there and then come back. Studland is a place where you pay quite a bit to park. This way we could leave the car in Swanage where, in winter months you can park cheaply. That gives the idea. Plain lumps of stone could have been used, but why not make them decorative. There are faces – human and others. Some portray activities you might not expect on a church. 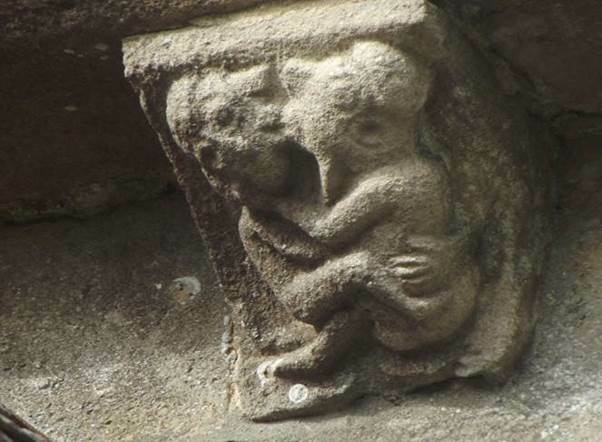 That’s as far as I’ll go, but other carvings are (or were when new) grossly vulgar. 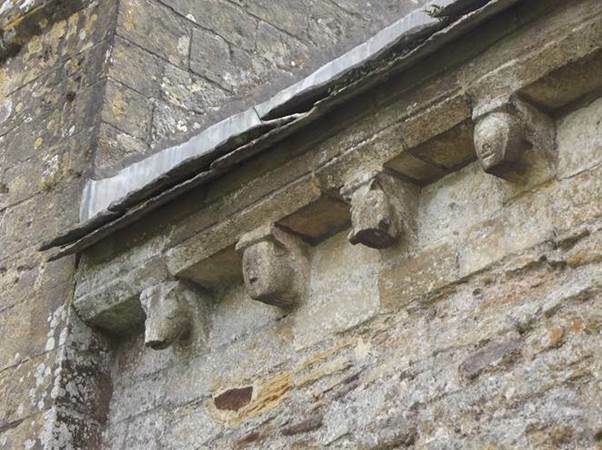 Of course, these carvings had a purpose – warning of sins and dangers. Some might say the church is a little austere. 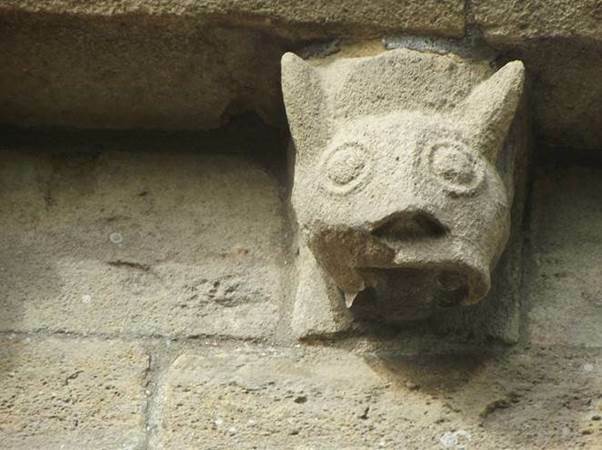 You have to look for the details to realise it has architectural curios and is a work of art. 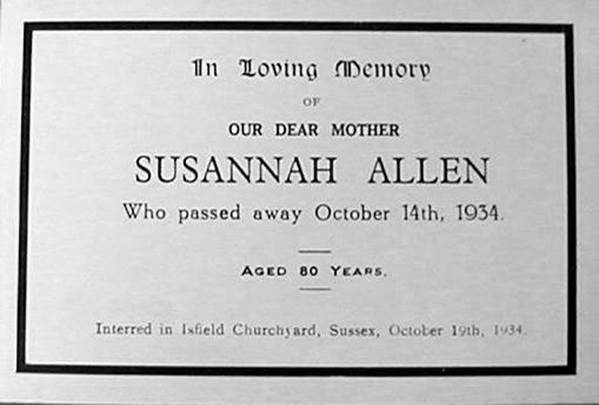 Susannah Allen was my great great aunt. I never knew her nor do I have a photo of her. I bet they existed and I have a hope that maybe a blog post will turn up something. I did know her daughter who was my gran’s cousin. Susannah was born Susannah Crosby in about 1854 in Butley in Suffolk where she joined quite a large family including my great grandmother, Sarah Ann Crosby. She was at home with her parents in 1861 but in 1871 she was a servant living in Hatton Gardens in London. 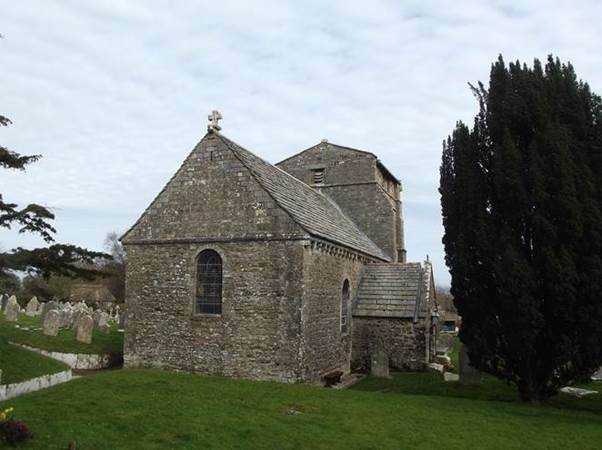 Mrs Crowe, the householder’s wife came from Blythburgh in Sussex so may have been known to the Crosby family. Susannah’s parents had married in Blythburgh. 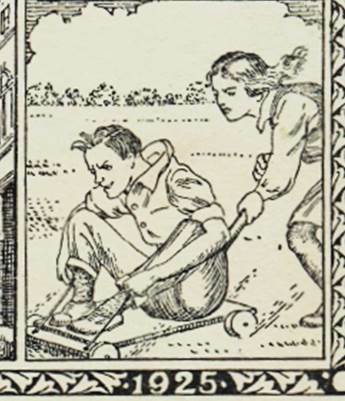 In 1881 Susannah drops right off the radar. I just can’t find her on that census and I am left wondering if she went abroad, or if an employer gave her a different name or if she just got missed out. By 1888 she was in Isfield in Sussex, where two older sisters lived and she married David Allen, the blacksmith. Susannah appears on the 1891 census living at The Forge with Susannah and two daughters. Mary was aged one and Mabel was three months. In 1901 David Allen had left the smithy and was a general labourer. 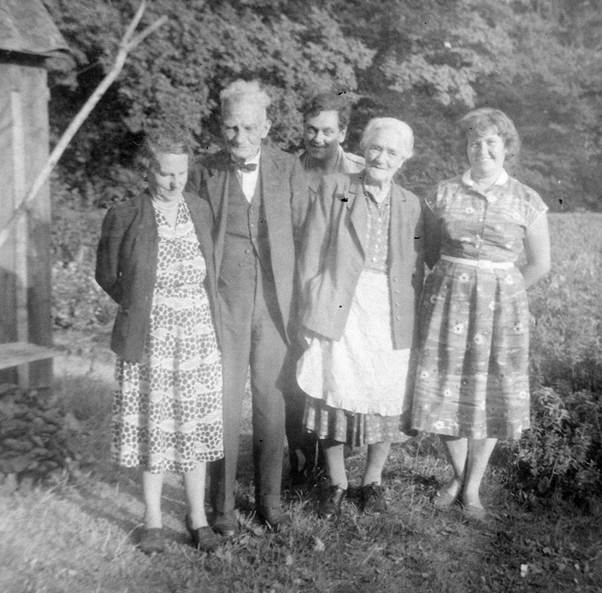 The family, which now included 6 year old Ellen (the one I knew), lived on The Street in Isfield. David died in 1905. He’d have been aged about 43 at the time. The death was registered in Brighton which makes me wonder if he might have had TB. There was a sanatorium in Brighton. In 1911 Susannah was a charwoman living at Isfield with an 8 year old niece called Dorothy Allen. I like the 1911 census for being written by the householder. With no photo of Susannah, I can at least see her handwriting. Susannah, ten years older than her late husband lived in Isfield until her death in 1934. My one tangible item for Susannah is a memorial card. We can see that Susannah was buried in Isfield churchyard. I knew her youngest daughter, Ellen (known as Nellie). When I knew her in the 1950s and 60s she was married to Reuben Josling. They had no children. Ellen Josling is on the left next to Reuben, her husband. Next comes my dad and his aunt Nellie from Firle. On the right is my mum. I never knew, or even knew of Susannah’s older girls. I’d love to hear from any members of their family. I never actually had a father in law for he died, suddenly and unexpectedly, when my wife was still but a girlfriend. That meant I knew the man – a real gentleman, kind, considerate and always helpful. He tended a neat and tidy garden but there was no evidence of an enthusiastic vegetable grower. Yet he clearly had been back in those early post World War II days when he was a newly married man. For a while, he and his wife lived in Morecambe and they obviously had an allotment on which Doug (for that was his name) grew vegetables. Not only that, he entered them in a show. 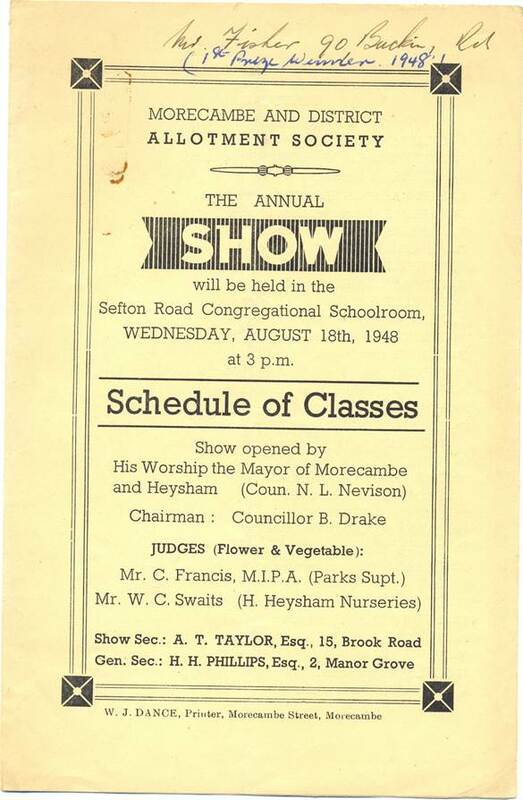 He’d be pleased to know, I’m sure, that 65 years on his daughter enters in our local show – but that might be another story. Let’s return to that Morecambe show in 1948. 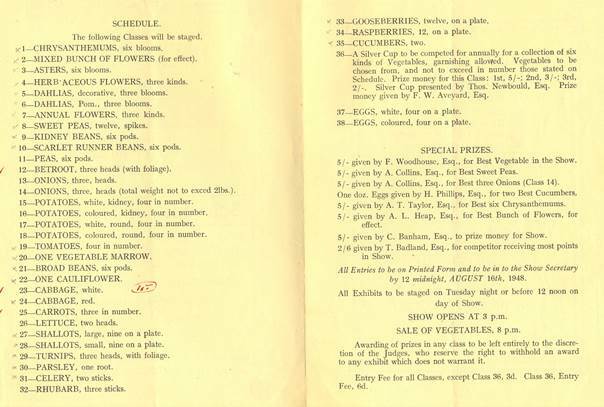 Like anybody else, Doug was a proud winner and maybe that is why he, and then his widow, and then his daughter kept his annotated show schedule from 1948. This is the front of the schedule and we can see who the important people were and the dates and times. At the top Doug has put his name and address and then added ‘1st prize winner 1948’. Doug was not an overall winner. He won one class and the inside of the schedule shows us what he entered and what he got first prize for. He entered beetroot, white cabbage and carrots and got his first prize for the cabbage. Yes, father in law was a champion cabbage grower. Now that’s something we find hard to match. Our own soil is rather light and sandy which is not the best for tight hearted cabbages. It looks as though he entered some flowers as well, ticked off with his propelling pencil and in his hallmark diminutive writing. For completeness let’s see the back of the schedule which carries a couple of adverts. 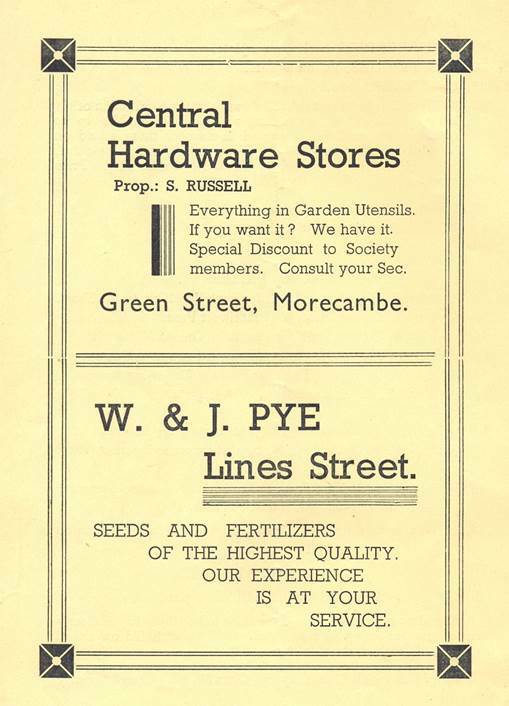 I don’t know Morecambe, so I have no idea if the shops still exist. There can be no doubt that I rather like oddities. 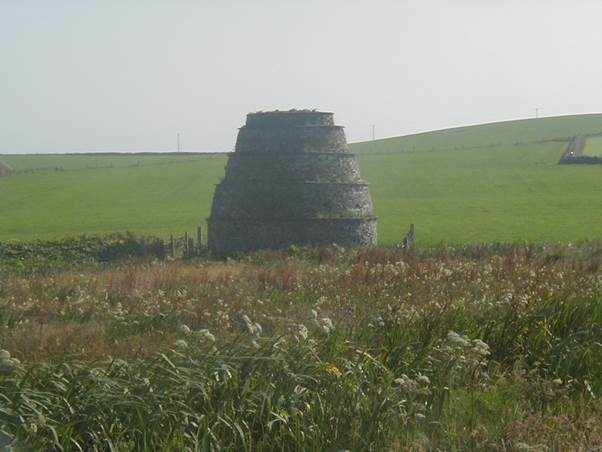 Dovecotes come into that category and back in 2004 I came across one on the mainland of Orkney. For those that don’t know, that’s the island group just off the North Coast of Scotland. And in that part of the world they call these structures Doocots Here is the one at Rendall. This structure was to house pigeons. This wasn’t because they looked pretty, but rather because they tasted good. 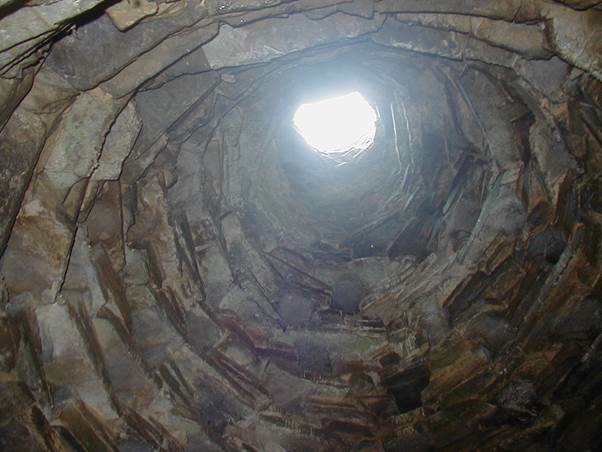 In England laws governing who was allowed to have a dovecote were strict and stringent. Unless you were a lord of the manor you could forget it. I do not know if the same law applied in Scotland. This doocot dates from 1648. This was before the union between the two countries in 1707 so although by the time this doocot was built England had a Scottish King, the two countries remained separate. 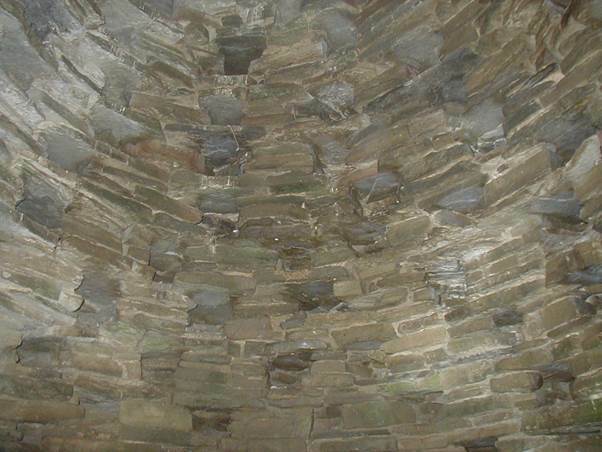 Inside the dovecote there are ledges in the wall for birds to nest. There’s a hole in the top for birds to gain access. Back in 2004 I was trying out one of those pairs of binoculars with inbuilt camera. It really wasn’t all that good but here’s a photo of the doocot taken with it. 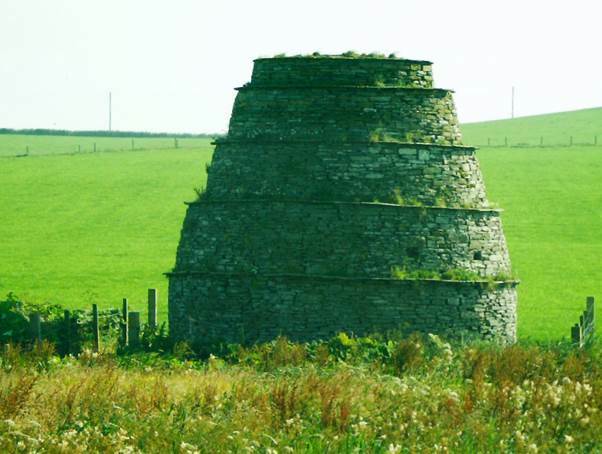 Should you wish to go Doocot hunting on Orkney to find this one you take the A965 from the ferry terminal at Stromness and then turn left onto the A966 near Finstown. The last bit of the journey involves minor roads through places such as Isbister and Gorseness. Taking a trip or holiday to do what you normally do at work is often referred to as a busman’s holiday’. But quite by chance I recently came across what was very much a railman’s holiday, or at least, a day out. We (my wife and I) had been away on grandparent duty – and very enjoyable it was too. Our route home took us through Chinnor in Buckinghamshire and I knew there was a heritage railway based there. But when you pass by on a rather dull Wednesday in March you don’t expect the line to be active. Rather, I expected pleasant surroundings whilst we studied maps to actually plan our route. I was surprised at the number of cars in the car park and there was, indeed, a train at the platform. Well, I had to have a look, didn’t I? 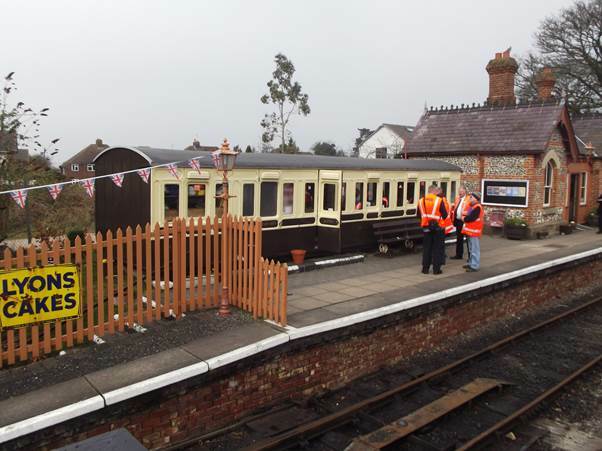 I discovered that the volunteers of the Chinnor & Princes Risborough Railway were welcoming their colleagues from Network Rail. That’s the national company that owns all the main line rail network. There was a scene utterly redolent of the 1960s. Now of course, I’d have preferred a steam train but for a generation or more this was what a local railway station might have been like. The jarring blots on the scene, as a recreation of the past, are the hi-vis jackets of the network rail men. The ‘train’ is a single car diesel built by Pressed Steel in 1960. It is on home territory for this line was a part of the Western Region on which this carriage saw service. The backwards 5 sign is actually a speed limit sign. Trains that pass that point must go no more than five miles per hour. 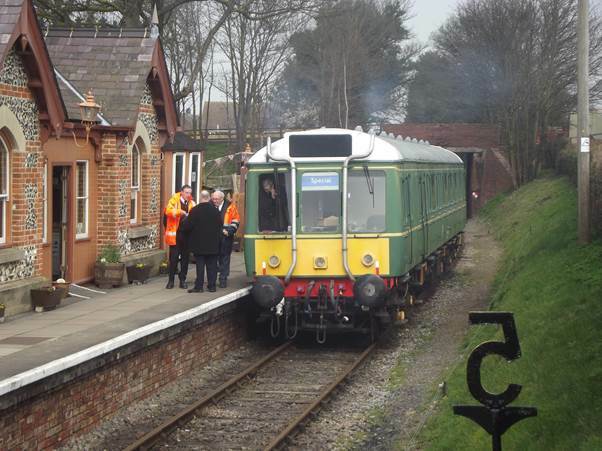 This really does capture a time which has past and the Network Rail boys were enjoying access to all of the facilities. 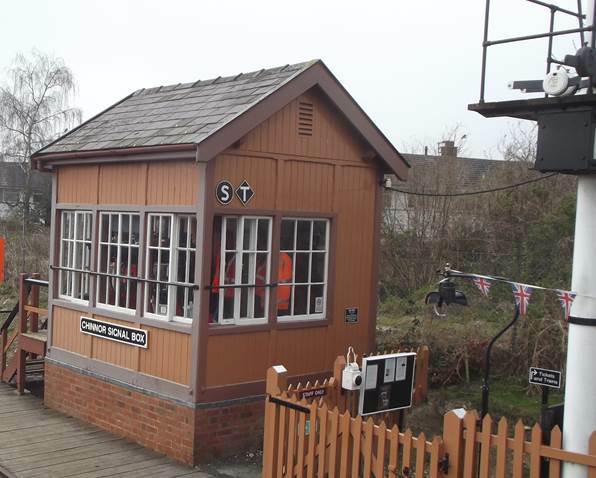 Chinnor Signal Box looks to be well filled with the orange jacketed fraternity. The box carries an authentic looking GWR name board, but actually is a double rescue from a Cheshire Lines location via a private garden. It dates from at latest the 1890s and experts ponder on it being older than that. Most of the Network Rail chaps had done what many a person does on a day out. They’d made for the café. The café is an old coach body. It is an attractive coach and our Network Rail men appear to be enjoying a cuppa inside whilst others chat on the platform. That metal ramp thing in the foreground, between the tracks, looks like an old Great Western Railway ‘AWS’. Even on the old steam trains, it was a system which gave drivers an audio signal as well as the more normal visual one. It meant speeds could be maintained in fog and train brakes were applied automatically if drivers ignored the warning they got. And now I shall have a little gripe about the railway’s web site. Most of it, at http://www.chinnorrailway.co.uk/ is admirable, but the stock list, I should say, has been written by real nerds for real nerds. I wanted to find out more about that lovely café coach and maybe it is the Cambrian Railway vehicle of 1895. This is described as ‘iu’. Scrolling down reveals that this means internal use. But does this mean it’s the tea shop? The same stock list describes the diesel car that I saw as a BR DMBS single car and goes on to tell us that its wheels are 2-2w-2w-2 DMR. Now that is just incomprehensible jargon. 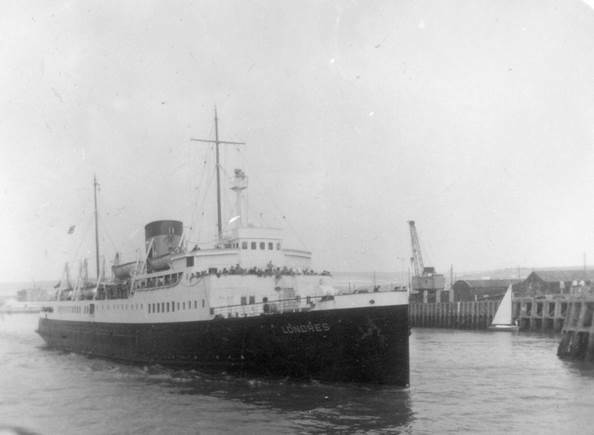 What I’d like to have known is: when it was built and by whom – and it gives us this; where it was used and on what kind of service; when it was withdrawn from service and what happened to it subsequently. By all means tell us it was a second class carriage, with a diesel motor, had a guards van and a driving cab at each end (which is roughly what that DMBS means. If you feel the need you can tell us it had mechanical transmission using cardan shafts and a four speed epicyclic gearbox but tuck that away for the nerds to find. But it’s a minor gripe for what looks to be a pretty little line. I find it interesting that I recall my mum loved a pair of oil lamps which I now have. 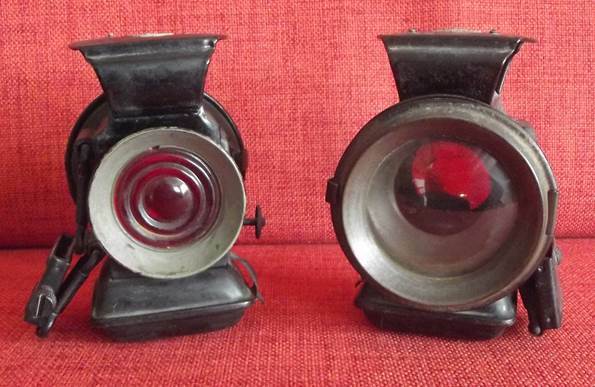 Mum died way back in 1967 when I was a teenager but I still think of these lamps as ‘mum’s’. 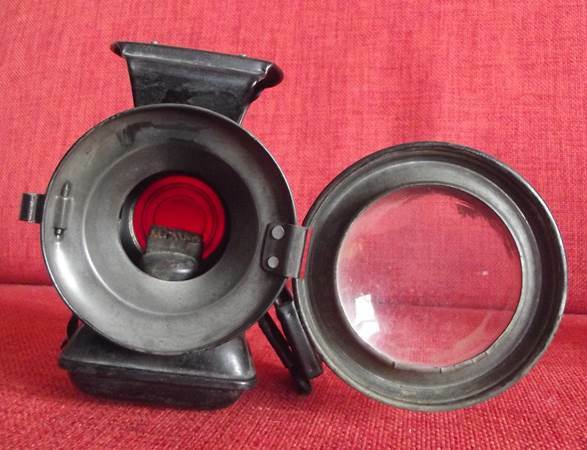 The lamps have a clear glass window at the front and a red glass window at the rear. 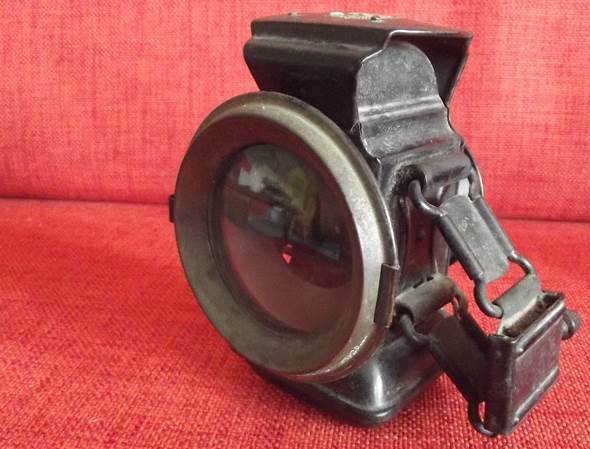 There’s a small green window at the side and a clamp for fastening on the other side. 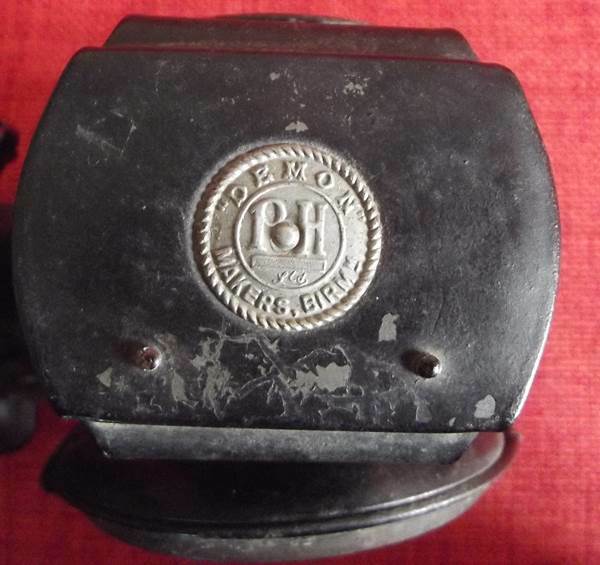 I do not know for sure what they were used for but almost certainly they were for bikes. Most similar lamps seem to have the fastening bracket at the back. The base of the lamp is the paraffin tank and the lamp is a simple wick lamp so there is a wheel adjuster to control the flame. The clear glass front opens so that the inside can be cleaned if it gets sooty. The lamp was made by a Birmingham firm. P H stands for Powell and Hanmer. 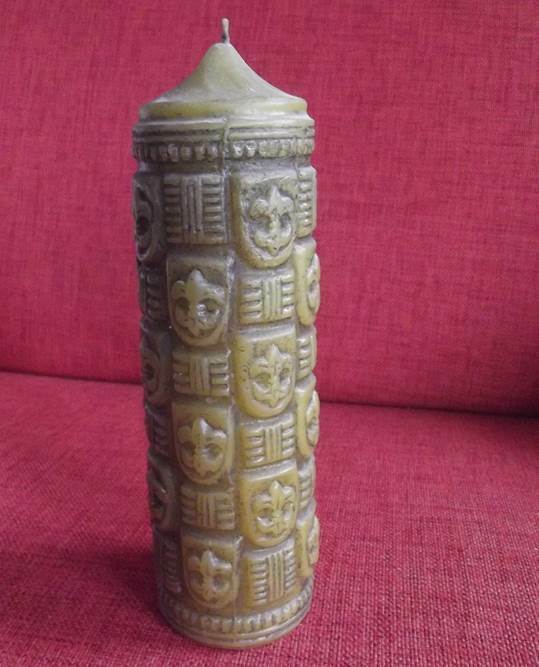 I think they made their ‘Demon’ lamps towards the end of the nineteenth century or possibly early in the twentieth. I have had them lit in the past. 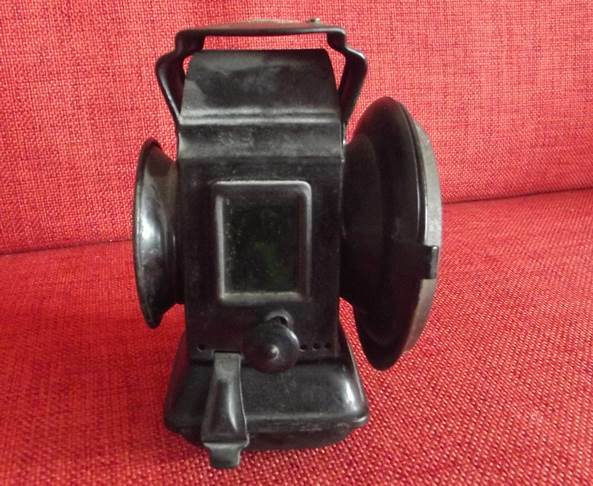 Lovely items – I am very fond of them as lamps but mostly for memories of mum.